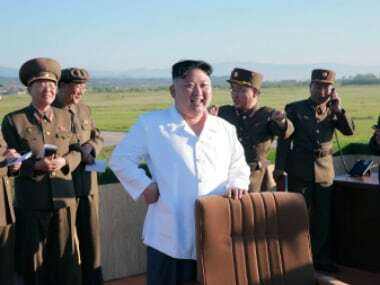 Seoul: North Korean leader Kim Jong-Un supervised the test of a new ballistic missile controlled by a precision guidance system and ordered the development of more powerful strategic weapons, the North's official KCNA news agency reported on Tuesday. South Korea said it had conducted a joint drill with a US supersonic B-1B Lancer bomber on Monday. North Korea's state media earlier accused the United States of staging a drill to practise dropping nuclear bombs on the Korean peninsula. The US Navy said its aircraft carrier strike group, led by the USS Carl Vinson, also planned a drill with another US nuclear carrier, the USS Ronald Reagan, in waters near the Korean peninsula. A US Navy spokesman in South Korea did not give specific timing for the strike group's planned drill. They also pose one of the greatest security challenges for US President Donald Trump, who portrayed the latest missile test as an affront to China.